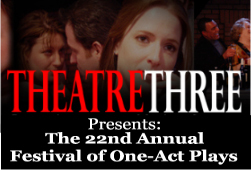 Help Theatre Three Celebrate it's 50th Anniversary! Now you can purchase merchandise from your favorite Theatre! Based on the true story, this classic is a powerful account of Annie Sullivan and her student, blind and mute Helen Keller. Intense, absorbing, and unforgettable, THE MIRACLE WORKER is one of the greatest dramas of the 20th century. 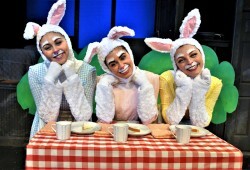 Peter, Flopsy, Mopsy, Cotton-Tail, Benjamin Bunny, the McGregors and all their friends come to life in this delightful adaption suggested by the characters created by Beatrix Potter. 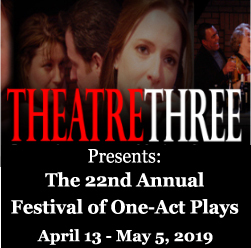 THEATRE THREE proudly presents The Twentieth Annual Festival of One-Act Plays, from April 13 through May 5, 2019, at The Ronald F. Peierls Theatre, on the Second Stage. Selected from over 400 submissions world-wide, these six cutting-edge premieres are guaranteed to entertain and engage. Theatre Three is proud to announce Bob Nelson has found a new home...Theatre Three! 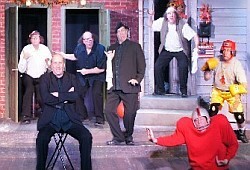 Bob Nelson will be appearing once a month on Theatre Three's second stage. 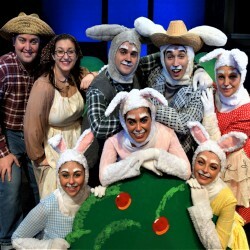 “We’re off to see the Wizard!” There is truly no place like home as the greatest family musical makes its way to Port Jefferson. In a spectacular celebration of the 1939 MGM film, follow Dorothy, the Scarecrow, the Tin Man, and the Lion as they journey down the Yellow Brick Road. 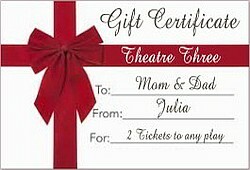 A Theatre Three Gift Certificate - The Perfect Gift! "A Lesson in History "From The Fires Voices of The Holocaust" at Theatre Three"
Theatre Three is proud to announce our 50th Anniversary Gala Celebration! Please join us for any, or all of these activities. Full details of these events will follow. Now you can order merchandise from your favorite Theatre!